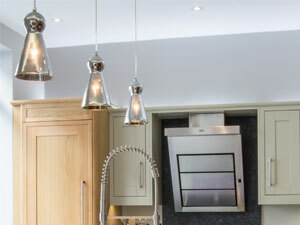 Remote mood lighting; options for changing brightness and colour; plinth lights and stylish over-unit pendants, (current favourites at Unique Kitchens) – these are all lighting possibilities that can add so much to your kitchen. Consider what you want to achieve with your kitchen throughout the day, evening and night time; contemplate how lighting could be used in terms of making the most of the available natural light within the room – this can vary greatly with a north or south facing aspect. It’s even worth giving thought to your kitchen during the changing seasons – from bright summer to rich autumn, warm winter and fresh spring – it’s possible to reflect or enhance nature’s own transformations within your kitchen interior too.